All flags free freight - All over the world. 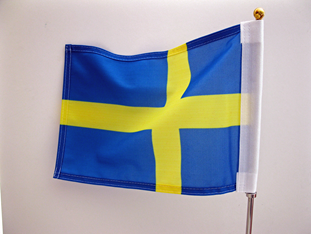 The flag is manufactured of 120gr/m2 knitted polyester in a special printer friendly high quality. It's sewn with double stitched seems and double layered corners. It's digitaly printed with a dye-sublimation process that uses heat to fuse the ink to the surface. Reading correctly on one side and has a mirrored image on reverse side. The end product has a high quality, brilliant full-colour image with nearly 100% penetration of the reverse side. 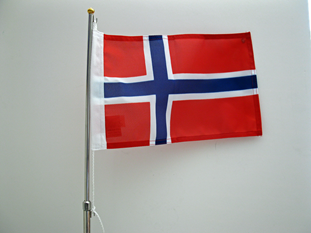 The flags are made with UV resistant ink for long lasting outdoor colours outdoors. Two flags are sewn together with a light blocking third layer in between to make sure the reverse side doesen't show through. The logo and letters reads correctly from both sides. It's dye-sublimation printed so all the fine details are shwn very sharply. All the fine details in the flag motive are shown. However, these 3 layer flags are heavier than one layered flags, which means that they only could be driven in a very slow speed to avoid that the flagpole come out of position. The max speed is 50 km/h. With rope loop at the top and rope hanging down. With an approximately 8 mm sleeve/tunnel at the front. The pole sticks into the car flag. Fixed car flagpole "Exclusive" type A. Flag with rope loop at the top and rope hanging down. Fixed car flagpole "Exclusive" type B. Flag with a approx 8 mm sleeve/tunnel at the front. The pole sticks into the flag. 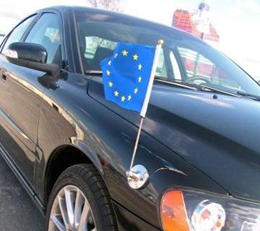 Magnetic car flagpole. Flag with a approximately 8 mm sleeve/tunnel at the front. The pole sticks into the car flag.